Meet our team of friendly and devoted staff lead by accomplished dentists with extensive experience. Dr. Tamara Kovačević Mikšić, DDS, was born in Rijeka in 1971. She graduated from the School of Dental Medicine in the year 1997 with all honours. After passing the State Medical Licensing Examination and getting her license, she enrolled in the masters’ program in the School of Dental Medicine at the University of Zagreb. Even now, she is regularly taking additional education seminars, in order to offer her patients first-rate dental service. After 4 years of experience in a private dental clinic, she opened her own clinic in 2003. She is a member of the Croatian Dental Chamber. 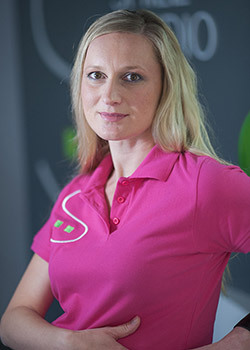 Mother of two, Mara and Dana, Dr Tamara is also a former Croatian skiing competitor and now a ski instructor. She also enjoys recreational tennis. Dr Tamara is fluent in both Italian and English language. Dr. Damir Mikšić, DDS was born in Switzerland in 1972. He graduated from the School of Dental Medicine in the University of Rijeka in 1997 with all honours. After finishing college he continued his education both in the Croatia and abroad (Rijeka, Zagreb, Milan, Vienna, Berlin, Lisbon…), gaining knowledge from world known professors like dr Lindhe, dr Dragoo, dr Jovanovich, dr Curilović, dr Malo, dr Anitua and many others, which can be affirmed by numerous diplomas hanging in his office. He is a member of the Croatian Dental Chamber, Croatian Society of Dental Implantology and Croatian Nobel BioCare team. He is certified to provide Astra and Nobel Biocare implant systems. Dr Damir also writes articles and columns in the magazine ‘Burza’. Together with his wife, he’s been a co-owner of a dental clinic since 2003. A father of two girls, he is also a tennis coach and former competitor in the Croatian Premier Tennis League. In his free time he enjoys cycling. He speaks English, Italian and German language. 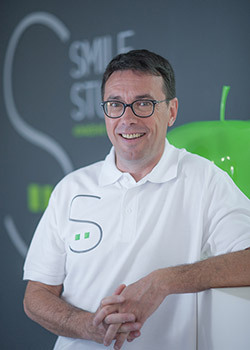 Dr. Silvio Ferreri DMD, orthodontics specialist, was born in the year 1967 in Rijeka. He graduated from the School of Dental Medicine in 1993, got his MA in 1996 and his PhD in 2002. In the year 1995 he began his academic career by working as an assistant professor for the Orthodontics course. Since the year 2005, he has been the head of the Department for Clinical Paedodontics and a deputy chief of the Dental Polyclinic at the Faculty of Medicine in Rijeka where he is also head of the Department of Orthodontics. He’s the owner and director of a private specialist orthodontic clinic since the year 2008. 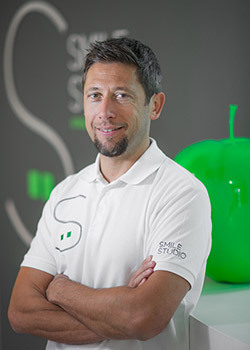 He became an orthodontics specialist in 2004 when he graduated from a three year specialization program at the School of Dental Medicine at the University of Zagreb. Dr Silvio regularly attends various education centers in Europe and America. He is also the author of numerous publishing in science and dentistry magazines, in addition to participating in around hundred dentistry symposia, often as a lecturer. He is a member of various Croatian and international dental organizations. In his professional career he is mainly in charge of orthodontics, even though he is actively following the development of the entire dental profession. Dr. Miljena Mia Girotto, DDS, has graduated from the School of Dental Medicine at the Faculty of Medicine in Rijeka, in 1996. She gained her postgraduate scientific title of the Master of Science at the School of Dental Medicine in Zagreb. She became a periodontology specialist in 2005 at the Periodontology clinic at the School of Dental Medicine in both Zagreb and Rijeka. She has worked, for 12 years, as an assistant professor of Periodontology at the Department for Oral Diseases, teaching seminars, having lectures and practice classes with graduate and postgraduate dentistry students. As a periodontology specialist she worked at the Clinical Hospital Center Rijeka. In 2008 she completed the „gIDE/UCLA Master program in Implant Dentistry at the University of California in Los Angeles (UCLA). Dr Miljena regularly participates at international symposia with her scientific and periodontology works and she also holds lectures and seminars both in Croatia and abroad. 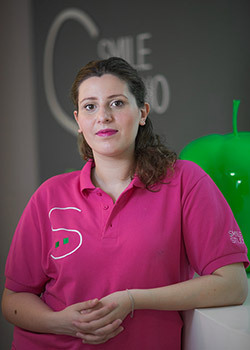 She is a participant of the international iTOP education program, where she attained the status of Top-level instructor. 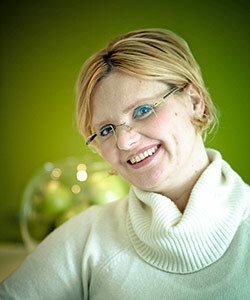 She’s also a co-founder and vice president of the ‘Women Dentists Worldwide’ association in Croatia. In addition to all that, she is also the editor and author of the patient-oriented dentistry magazine ‘Smile’ as well as a translator for dental and scientific texts. 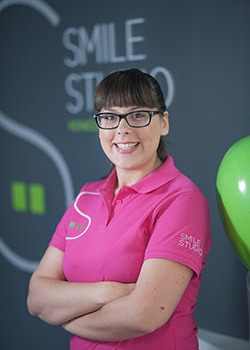 Luckily I was referred to Smile Studio through several friends and colleagues that had gone to the clinic for their care and had come away from the experience very pleased. And now I too can say, without reservation, that I have been exceptionally impressed and pleased with all the care I have received since my first visit!